Sadly (for you, as a developer) it is easily possible to bypass macros which run automatically. 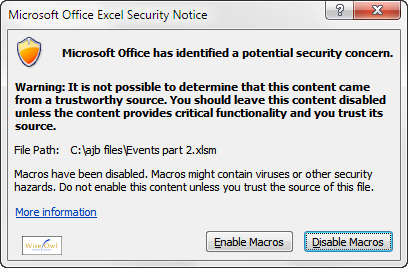 A typical dialog box when you open a workbook containing macros. If your user chooses the default button to disable macros, there's not much you can do about it! An alternative way to bypass macros is by holding down the SHIFT key just at the point that you're about to open a file. You can ask them nicely to enable macros in your workbook. You can copy the workbook into a trusted folder (but you'll need to have administrator rights to their machine to do this). You can digitally sign the macro (but the recipient will still be able to refuse to accept it). Basically, there is no way of forcing a third party to run your macros - which if you think about it is as it should be!